rec. dates and locations not supplied. 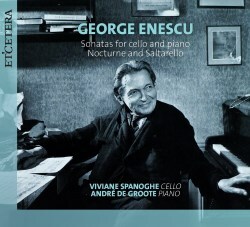 Enescu belonged to the same generation as Bartόk and Szymanowski but is taking longer to come into focus. This is partly because he was Romanian, and is, so far, the only Romanian composer to have won an international reputation. Then he was, in his lifetime, better known as a violinist, which militated against his recognition as a composer. He was a perfectionist who published relatively few works and kept others by him for years until he could be satisfied. The detail of his markings in his scores – which are in any case often difficult to get hold of – is quite astonishing and daunting to a would-be performer. Yet the quality of his mature work is undeniable and is slowly getting better known. He started as a pupil of Fauré, and later became increasingly influenced by Romanian folk music. His mature works often feature winding sinuous lines, flurries of elaborate ornament and sometimes intriguing rhythms. His harmony is adventurous but rarely aggressively dissonant. He is melodic but not tuneful in the usual way, which minimizes his appeal. His best work has a haunting quality entirely his own, and once you are used to the idiom it pulls you back again and again. His two cello sonatas share an opus number but not a date. The first is more than the student work it might appear to be; the second is fully mature. One of the great cello sonatas of the twentieth century, it is with this that Spanoghe and de Groote begin their recital. The Sonata begins with a long, irregular lyrical line on the cello to which I was at once attracted by Spanoghe’s attractive tone, expressive phrasing. Its quality of searching rather than stating seemed to me in keeping with the music. Her lovely tone was a pleasure to hear in itself and kept my attention in a long movement. Incidentally she plays a Francesco Ruggieri cello of c.1680. The second movement is dark and sinister with some strange flutterings, sighs and sudden protests. Eventually an anguished theme breaks out before both instruments descend to the depths again. The third movement draws on folk idioms as does the finale. Suddenly a stamping dance appears but it cannot sustain its momentum. The piano parts are elaborate but rather in the manner of the piano parts of Bartόk’s violin sonatas which never do what you would expect. Between this and the first sonata are two short works which only turned up in 1994. They are both early. The Nocturne is somewhat like Fauré with a cello melody over a flowing accompaniment. The Saltarello is a vigorous dance with a good deal of interplay between the instruments. I thought this rather Schumannesque. The first sonata is, as one would expect in an early work, a good deal more traditional than the second. However, it is not a makeweight; indeed, Casals once played it in public with Enescu playing the piano part. Again I thought of Schumann. The first movement is serious, even sombre. The Scherzo is lighter, playful, even skittish. In the slow movement the cello has a long line which ranges high and low over a repeated dotted rhythm in the piano. The rondo finale has a great variety of themes which at last break away from the melancholy of much of the rest of the work. I have already praised Spanoghe. De Groote is a good duet partner, who makes the most of his often quite elaborate parts and works well with Spanoghe. The two of them are based in Belgium where they also have solo careers. They have already recorded much of the cello and piano repertory so are used to working together. Although no recording details are given, the instruments are well balanced in a suitable chamber acoustic. The sleeve-note is rather general about Enescu but has informative biographies of the two players. There are a few other recordings, as well as some with only one or other of the two sonatas or the two short pieces. I have long admired the 1998 one by Gerhard Zank and Donald Sulzen — originally on Arte Nova 74321 54461 2, now part of Sony on 23721 31235. Listening to them alongside Spanoghe and de Groote I don’t think there is much to choose between them. Spanoghe’s more questing manner on the cello is perhaps slightly preferable and maybe Sulzen is more imaginative on the piano. Those who have that version can rest content; newcomers will be very happy with the new one.